An 18thc oak coffer bach with a superb colour, probably from Carmarthenshire, Wales. 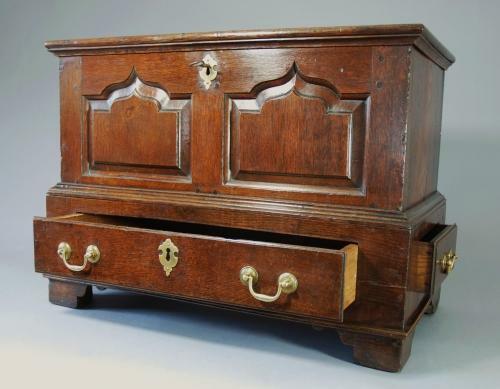 This small coffer has two shaped & fielded panels to the front with a brass escutcheon plate with key. The drawer underneath is pine lined with two brass handles & an escutcheon plate. There is also a drawer to the side, lined with elm, again with a brass handle. This drawer has had minor repairs in some places over the years. The handles have been replaced over the years also. The piece sits on bracket feet & the lid is fixed in place with rail hinges, rather than a normal hinge.